Google is really playing around with different interfaces to help you fine-tune your search results. 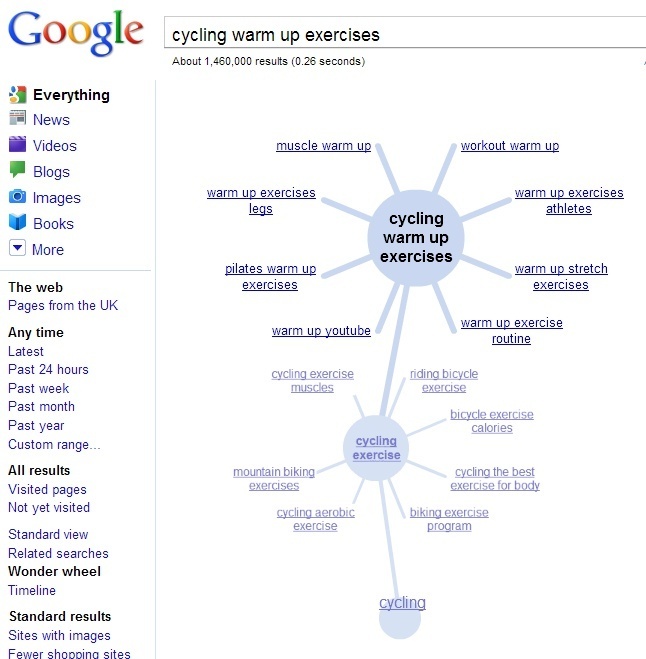 For a pretty broad phrase like 'cycling', there's a 'Wonder wheel' option in the filtering section on the left. This wonder wheel provides a natural way to home in on your exact topic of interest, with organic search results appearing on the right and with ads removed completely. I like this concept but don't like the way the search results layout changes - no alternative springs to mind though! The wonder wheel flash app takes centre stage on the page, and there's little room for much else. Once you've found the most relevant term you can dismiss the wonder wheel, and search results return to normal.